A healthy change is taking place: Consumers are demanding that brands engage them in conversations versus one-way blasts. But for this to be effective, both consumers and marketers have to change previous behaviors. Consumers have to recognize that to receive more relevant and personalized communications, offers, and experiences, they need to provide deeper personal or business information. Marketers have to recognize that to competitively differentiate, they have to provide significantly more personalized communications, offers, and experiences. However, true personalization is based on much more than traditional transactional data. Marketers must earn the right to collect increasingly deeper levels of preference-based data. Trust makes customers receptive to a reciprocity-based exchange of data in order to receive enhanced experiences. The improved customer experience reinforces trust. That, in turn, enhances trust. Now customers are more motivated to provide deeper additional information. Marketers can now engage customers in a deeper level of reciprocity-based interaction. And the cycle continues, based on ever-deepening personalization and value. An exciting example of reciprocity-based marketing is Disney’s MagicBand bracelet app. In return for the collection of consumer data, Disney offers guests the ability to “enter the parks, unlock Disney Resort hotel room[s], and buy food and merchandise. Plus, [the] MagicBand gives FastPass+ access to all the experiences selected online.” Users of the band and app can receive an email or text message about availability of reservations or rides noted as being preferred experiences. 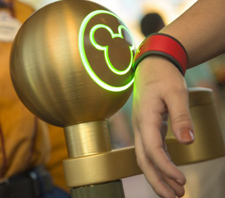 In terms of data collection, MagicBands link electronically to an encrypted database of visitor information. The bands contain a radio frequency identification (RFID) chip that allows for the collection of intelligence that is coupled with guest input into the My Disney Experience app and Web site (input is voluntary.) All of this data gives Disney valuable information about customer preferences, which are then used to provide high-value experiences. Trust: The marketer can be trusted to deliver on a fundamental brand promise. Listen: The brand will listen to customers’ needs, suggestions, and concerns. Deliver: The brand will provide communications and experiences relevant to customers based on their individual preferences. It is not customers’ responsibility tell marketers what they want. Marketers must ask--and then respond with reciprocity-based customer experiences based on feedback. Competitive differentiation is rooted in the ability to deliver offers, communications, and experiences based on the exchange of deep customer data and preferences. Multichannel reciprocity-based marketing addresses the customer experience across all touch points, departments, locations, and company levels. A high value, reciprocity-based customer relationship needs to be maintained throughout the life cycle of the customer, not just during the points of initial sale or add-on sales. Ernan Roman Direct Marketing's Customer Experience strategies achieve consistent double-digit increases in response and revenue for their clients, which include IBM, MassMutual, QVC, Microsoft, and Symantec Corp.
As a leader in providing Voice of Customer research-based guidance, ERDM has conducted over 10,000 hours of interviews with their clients' customers and prospects, to gain an in-depth understanding of their expectations for high-value relationships. The results achieved by ERDM's VoC-based strategies earned Ernan Roman induction into the Marketing Hall of Fame.